DZMM made it as the country’s most awarded news organization at the 11th Philippine Quill Awards by bagging three honors, including the highly coveted Top Award in Communication Skills and two Awards of Excellence. DZMM’s website DZMM.com.ph beat the other nominees for the prestigious Top Award in Communication Skills division namely TV5’s online news portal InterAksyon.com; Manila Water Co.’s “Sustainable Growth: Manila Water’s 2011 Sustainability Report”; Manila Electric Co.’s “Meralco and One Meralco Foundation’s Unified 2011 Annual Reports”; and Smart Communications’ SmartSpeak Online. ABS-CBN’s flagship AM station also received two Awards of Excellence for DZMM.com.ph in the electronic and digital communication category and for its annual fun run for a cause “Takbo Para sa Karunungan Year 2012,” where over 4,000 runners turned up to run for the benefit of 75 young Filipino scholars from areas devastated by recent typhoons. 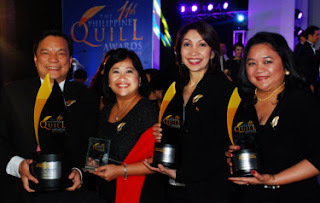 To date, DZMM is the lone news organization to earn two Top Awards in the history of Philippine Quill Awards, including 2010’s Top Award in Communication Management for “DZMM Kapamilya, Shower Na!,” a public service project launched in October 2009 to respond to the hygiene and sanitation needs of Typhoon Ondoy victims. The Philippine Quill Award is being given by the International Association of Business Communicators (IABC) Philippines and is awarded to communications programs and tools that exhibit clear objectives and strategies, creative executions and measurable benefits. It is considered to be the country’s most prestigious and relevant award for business communications programs. IABC is a global network of more than 14,000 business communication professionals in over 60 countries. The Philippines is the first IABC chapter outside North America.